﻿ Soho Boutique Hotel Da Nang (Vietnam) | FROM $24 - SAVE ON AGODA! "Location and Service is good"
"Location wise - it's very close to the beach." "The breakfast buffet is amazing;"
"Breakfasts were fairly varied and plenty of food." "The hotel is good in general." 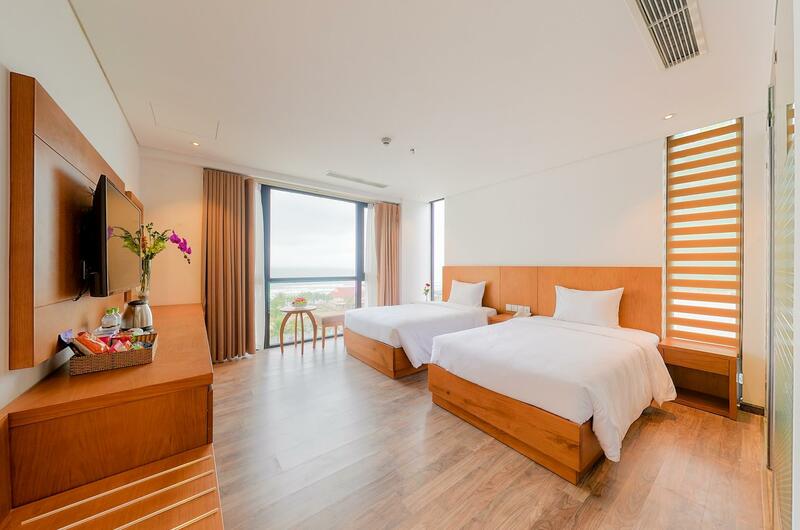 Located in the lovely area of Phuoc My, Soho Boutique Hotel Da Nang enjoys a commanding position in the family fun, culture, sightseeing hub of Da Nang. Only 4 km away, this 3.5-star property can be easily accessed from the airport. With its convenient location, the property offers easy access to the city's must-see destinations. 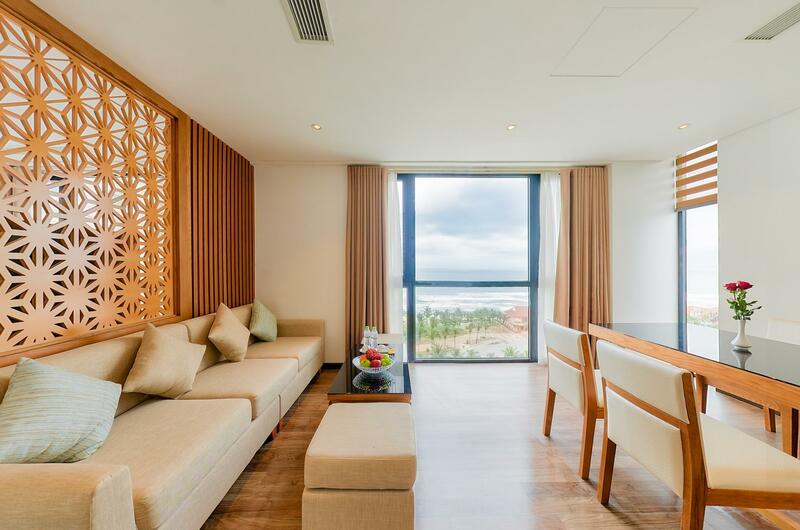 Take advantage of a wealth of unrivaled services and amenities at this Da Nang property. This property offers numerous on-site facilities to satisfy even the most discerning guest. Step into one of 52 inviting rooms and escape the stresses of the day, A selection of amenities can be found in most rooms, inlcuding closet, complimentary tea, towels, wooden/parqueted flooring, slippers. The property offers fantastic facilities, including snorkeling, private beach, outdoor pool, massage, karaoke, to help you unwind after an action-packed day in the city. 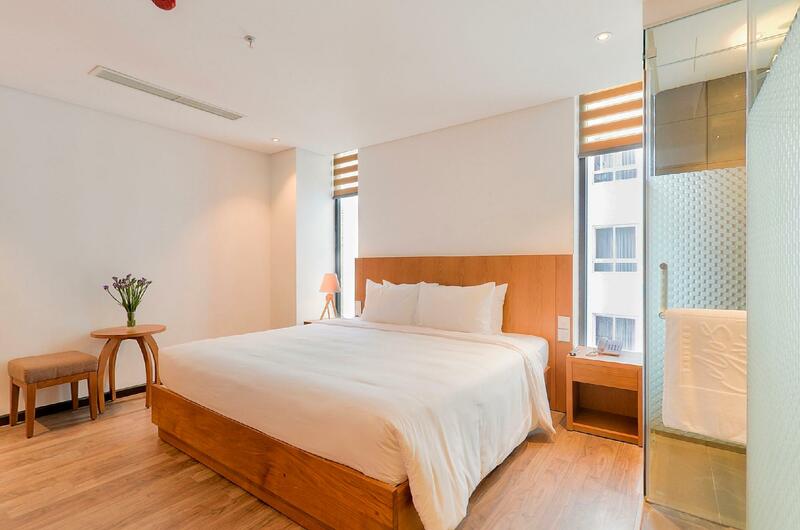 With an ideal location and facilities to match, Soho Boutique Hotel Da Nang hits the spot in many ways. 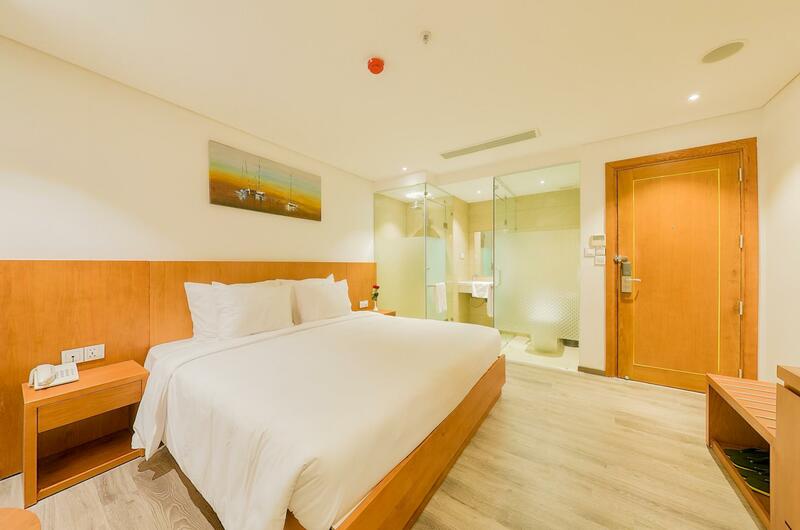 "The room is spacious and clean, bed and pillows are comforta..."
The hotel is simple and basic with clean bedding. Amenities are fully provided for and the price included breakfast. For the amount we paid for, we have no complaints. It is a 10 minute walk from the beach and about a 5 minute Grab car to any of the popular locations. The shower however, tends to overflow! So perhaps keep some towels handy for the bathroom floor. We had a very comfortable, light and airy room. Breakfasts were fairly varied and plenty of food. There were many eating places nearby and it was a very short walk to the beachfront. The small pool looks very clean and there are good views to the beach. Great buffet that changes daily. Lots of fruit. Great pho and even a few dim sum choices. Beautiful rooms and lobby. The pool area, though small, has a spectacular view of the ocean. The massive amount of new building in the area might change that in the future. Staff were friendly. The location is a short walk to the beach and good restaurants. Our room had no window, but since the room is lovely, and had a great photo of Da Nang all lit up, it didn’t bother us. Though the rooms with windows look spectacular. We peaked into a few when they were being cleaned. The bed and pillow are very comfortable. It’s picky to talk about the level of English when one is not in an English speaking country, but it would be nice if there were always one staff on who had good English. Room was spacious and comfortable. Located before the Han bridge and it is less buzzling as compared to after the bridge. Near to the beach and many seafood restaurants and eateries (5-10mins walk). Hotel offers free bicycle and motorbike usage. Swimming pool and gym were very small and we did not bother using them, did our workouts at the beach instead. We mostly took grab around da nang as it was affordable and reliable. 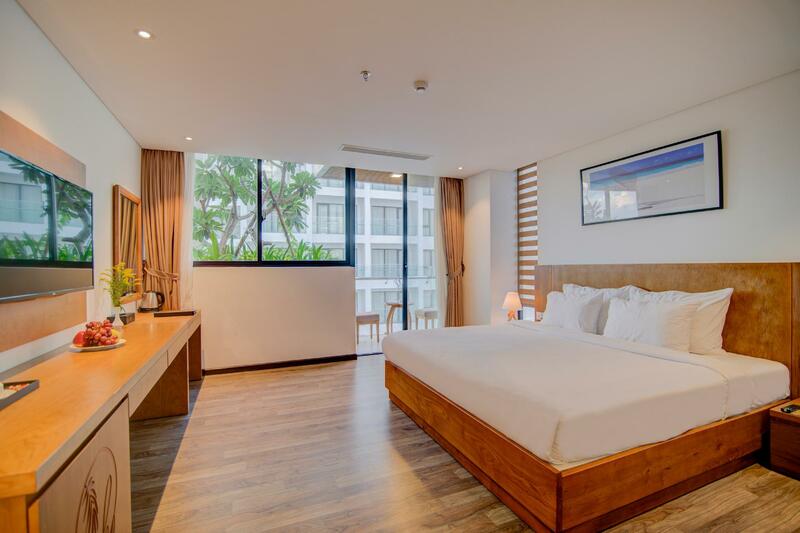 Overall a very comfortable stay that is value for money. Would choose soho again if we return to Da nang. The room itself is big with balcony. Cheap and value for the money we paid for. The quality and variety of the breakfast buffet is good. The staff are friendly but can not communicate in English much. Travelled with 2 other friends. It's a room just nice for 2 people. For the additional person, they added a bed and there's practically no space to walk. The additional bed's end facing the door, which for some Asian, is bad. Otherwise, the room is nice despite the constant weird noise. The room's decent and clean. Breakfast is just ordinary. Nothing special. Location wise - it's very close to the beach. About 5 mins walking distance. And there are a lot of restaurants and mart nearby. The staff are very friendly and helpful. Beautiful hotel with great helpful staff. Seconds from the beach and great views from your room. Da Nang is making the waterfront a paradise but as a result there is a lot of construction around you. It can become a little loud in the evening but don’t let that deter you this place is great. The hotel is great, nice and clean ina good location. The only negative was that the breakfast is no where near the standard of any average hotel. Few and limited items available. On another note, i recommend renting rooms with window or balcony since the hotel has some with no windows at all. This hotel is pretty new so don’t expect much facilities here. The swimming pool is at the very top of the hotel but it is relatively small. Breakfast was okay, not many options. The room is nice and comfy. The shower place and the toilet bowl are separated with doors with sink in the middle. Just be informed that the hotel will ask for your passport to keep upon checking in. We wasnt inform about this and were taken aback for a moment. Just realized afterwhich that its the norm here in Vietnam. Dont mind to stay here again but I would love to try out other hotels too. For the price we paid, I would recommend people to stay here. Dear Nazurah, Thank you so much for this wonderful review that you gave us. We’re very happy to read your kind words on the recent stay at Soho Boutique. We’re delighted your experience with us was so great! We look forward to hosting you again soon and to sharing another amazing experience with you. Have a nice day! Best regards, Sales Department. We stayed here for 2 nights. The room are comfortable but quite small. Good location just 5-10 minutes walk to the beach. Shop & restaurant nearby. The breakfast was not good need to improve with more selection. Reception staff were very helpful & always smile when we need to help any question. Will comeback here. The hotel was very close by to shops as well as the beach. Few good massage parlous and restaurants as well. The hotel room was clean and I felt so grateful as the hotel staff upgraded my room for free. Breakfast was good and really worth the money you pay as my room came together with breakfast. There is a construction going on the next building hence the pool doesn't had that much privacy as you can see construction workers same level at the next building with the hotel's pool. But the pool is descent and facing the beach. Special thanks goes to Mr. Zeng (Rum Tran) for helping me out with my tours and making sure I had a perfect stay! I'll definitely return back to this hotel! My main gripe with this hotel is the weird toilet and shower positioning which makes it very odd and the water does not flow properly to the recess drainage. Morning breakfast at the canteen is like a warzone.